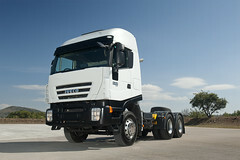 Every aspect of the real and perceived quality of the cabs of the NEW STRALIS has been updated and upgraded. The result is a working environment tailored to the task of the vehicle and the needs of the driver. The fully re-designed dashboard, the seats and the new floor of the HI-STREET and HI-ROAD cabs have been developed alongside the range-topping HI-WAY, and offer the same levels of ergonomics and practicality. New dashboard with IVECONNECT multi-function touch-screen. Intuitive and ergonomic new controls. Storage units and compartments of various sizes. Spacious interior with 1 or 2 bunks (HI-ROAD cab).